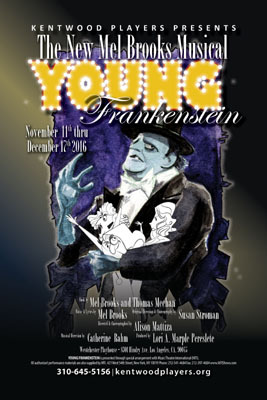 Young Frankenstein is a wickedly inspired re-imagining of the Frankenstein legend based on the 1974 comedy film of the same name written by Mel Brooks and Gene Wilder. This hilarious musical is a parody of the horror film genre, especially the 1931 Universal Pictures adaptation of Mary Shelley's Frankenstein and its 1939 sequel, Son of Frankenstein. The story follows bright young Dr. Frankenstein as he attempts to complete his grandfather’s masterwork and bring a corpse to life. But this musical comedy hit, winner of the 2008 Outer Critics Circle Award, is not without scary and hilarious complications. With such memorable tunes as “The Transylvania Mania,” “He Vas My Boyfriend” and the famous “Puttin’ On The Ritz,” this show is scientifically-proven to be monstrously good entertainment! Featured characters: front: Inga, Frederick, Elizabeth; rear: Igor, The Monster, Frau Blucher. Frederick reads his grandfather’s book: How I Did It. Igor brings Frederick a brain for his reanimation experiment. Frederick checks to see if The Monster is alive. Frederick has upset the Monster and attempts to get Igor, Inga and Frau Blucher to help him. Elizabeth's surprise arrival interrupts Frederick and Inga “working” in the lab. The Monster frightens Elizabeth... until she gets to know him better! Is Igor doing an impersonation of Hamlet? Will the Monster be a friend to the Blind Hermit? Elizabeth discovers “Deep Love” with the Monster.